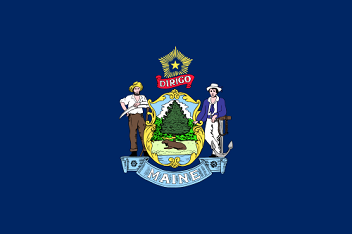 The dark blue State Flag of Maine features an image of the seal above which is the motto and the yellow five-pointed Polar star which is a symbol of the unity. The two figures represent a farmer and a sailor. The flag serves as a symbol of honor, heritage and regional pride and is displayed at state buildings. There is a strict Order of Precedence for flags. State Flags are displayed in order as they entered the Union. Car Flags are often displayed to represent of an individual's allegiance to their state. Maine State car flags are used by their owners as mobile emblems of their home. Car flags are usually made from strong materials and are attached to a car via a pole and clip window attachment. What is the design of the Maine state flag? What does the Pine Tree symbolize? According to the ancient laws of heraldry a pinetree symbolizes the tree of life and humanity and a symbol of steadfast friendships and enduring fame. Who designed the Maine State Flag? The name of the designer of the image on the state seal (which is a feature of the current flag)was believed to be made by Bertha Smouse, the step-daughter of Colonel Isaac Gardiner Reed who was the chair of the Committee charged with the task of designing the Seal and Arms. What is the history of the Maine State Flag? 1909: Legislature approved a new design, featuring the Maine Coat of Arms on a blue field. The Maine flag is kept and used as required by the code specified in the constitution of the state. 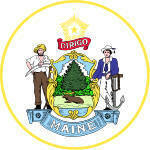 The first Maine flag was adopted in 1901 and was legal until 1909. It featured a buff field, and image of the white pine and the Polar Star in blue.